Orwell began this diary on the way to Morocco. The diary is typewritten, almost certainly from a handwritten original; the handwritten version for 12 to 28 March 1939 is extant and annotated, in Orwell’s hand, ‘To be typed into the diary when machine is available.’… Orwell annotated his typescript in the margins and wrote longer notes, often illustrated, on blank facing pages. The Orwells arrived in Morocco on 11 September 1938, as the deposition before Robert Parr, the British Consul at Marrakech shows. Orwell’s date of birth is given as 1902, not 1903. In his letter to A. H. Joyce of 12 February 1938, he said that by mistake his date of birth had been incorrectly entered as 1902 in his passport (‘I was born in 1903 (by mistake this has been entered as 1902 on my passport)’)…. They were to stay for a little over six months, sailing from Casablanca for England on March 26 1939. 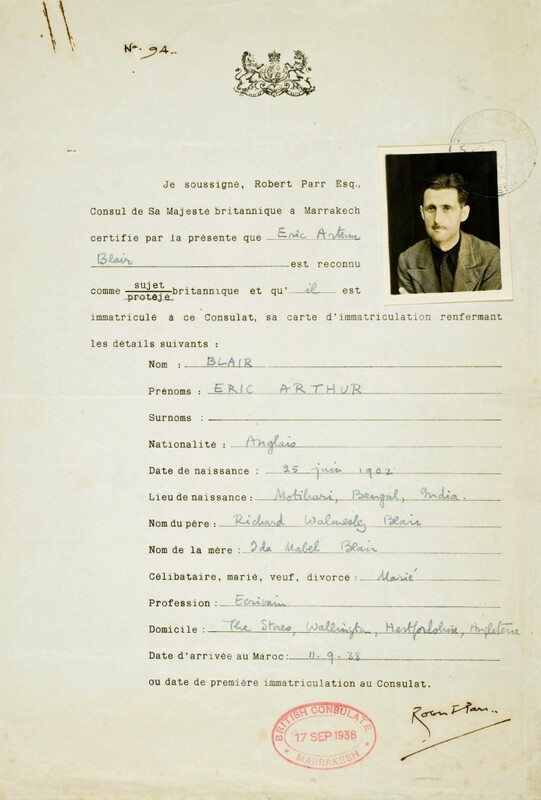 On 18 September, signing as Eric Blair, Orwell accepted the lease of ‘une villa et une piece de domestique, route de casa [Casablanca], apartenant a Monsieur Simont, Boucher a Marrakech’ for a minimum period of six months at 550 francs per month, running from 15 October 1938. The villa was about five kilometers from Marrakech. R. L. Bidwell records that French franc as being at 165 to the pound (31 to the dollar) in March 1938, and by January 1939 the rate had become 176.5 to the pound (39.8 to the dollar), a rate maintained at the following January (Currency Conversion Tables, 1970, 20), Thus, 550 francs was about £3.25 ($15.50) during these six months. The rent of the cottage at Wallington was 7s 6d per week or £1.50 in today’s coinage if not value for four weeks. The Moroccan lease was negotiated by Désiré Bézert of Marrakech-Guéliz. Until they could take up residence in M. Simont’s villa, the Orwells stayed at Madame Vellat’s house, rue Edmond Doutte, Marrakech. For Orwell’s time in Morocco, see Crick, 368-74; Shelden, 329-34 (U.S. edition 300-05).